Marion W. “Monk” Moorehead, 89 passed away Tuesday, November 27, 2018. He was born August 3, 1929 in Hopewell to the late Charles Cecil and Lillie (Burrier) Moorehead. He retired from Armco as a maintenance foreman. He served our country and protected our freedom in the United States Navy. Throughout his life, Marion spent many hours playing, coaching and watching innumerable baseball games. Following his retirement, he could often be found watching the Reds and other favorite teams compete on TV. He was also a diehard fan of Ohio State women’s basketball. He could recite names and accomplishments from the many games he took in. Frequently, he and his brother, Bill, would talk by phone during games to offer commentary and advice to whichever team they were watching “together”. Marion was a farm boy turned urban landscaper. 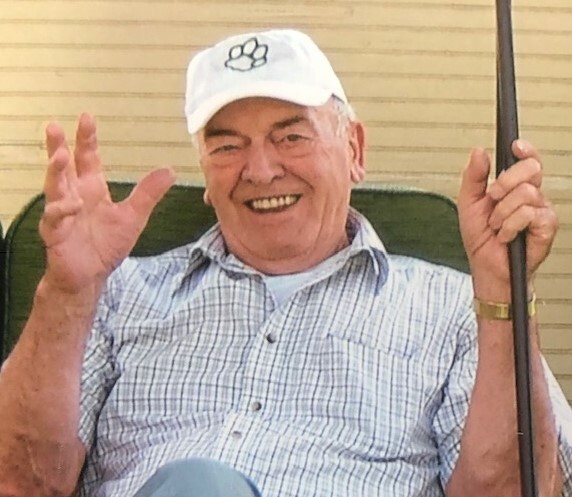 He took great pride in his home and yard and spent many hours transplanting and reviving dead plants, cleaning flower beds and disposing of offending twigs, leaves and clippings. Towards that goal, he was an inveterate antagonist of all forms of urban wildlife, including rabbits, squirrels, pigeons, starlings and the occasional rowdy tomcat. His air rifle was never far from his reach. He is survived by two sons: Bob (Debbie) Moorehead and Tom Moorehead; a brother William “Bill” Moorehead; 3 sisters in law: Mary Moorehead, Marie Moorehead and Imojean Moorehead; a brother in law Ellis Hill; six grandchildren: Phil (Grace) Moorehead, Keith (Brittany) Moorehead, John (Sarah) Moorehead, Steve Moorehead, Troy Moorehead and Colton Moorehead; great grandchildren: Finley Moorehead, Dylan Moorehead, Madeline Moorehead and Nathaniel Moorehead. In addition to his parents he was preceded in death by his wife Virginia (Malloy) Moorehead; siblings: Russell, James, Howard, Freddy, George, Eleanor, Sarah and Phyllis. In lieu of flowers, memorial contributions may be made to Genesis Hospice, 713 Forest Avenue, Zanesville, OH 43701. Calling hours will be from 11AM to 1PM Saturday, December 1, at THE SNOUFFER FUNERAL HOME, 1150 W. MILITARY ROAD. Funeral service will begin at 1PM in the Snouffer Chapel. Burial to follow in Poplar Forks Cemetery, Gratiot.